Pink Lemonade : Dr. Perricone Summer Giveaway (with polyphenols benefits)!! Dr. Perricone Summer Giveaway (with polyphenols benefits)!! 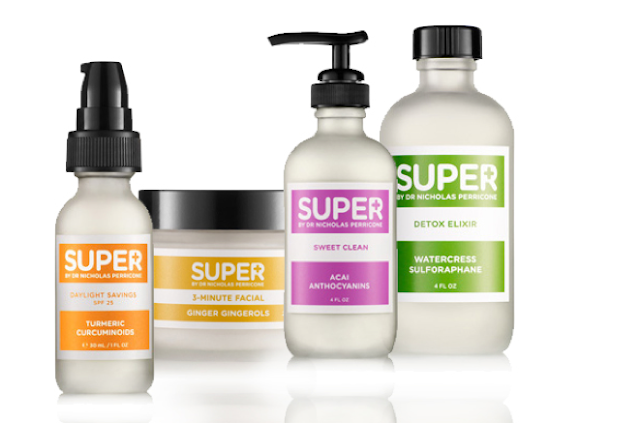 Want to give your skin a major summer boost with the help of Dr. Perricone SUPER products created with such beneficial ingredients as ginger, acai, watercress, curcumin, polyphenols benefits and melon extract for skin? Contest will be open for 10 days and the winner will be selected randomly. I think I'd go for the skin nutrition kit. Thanks for the great giveaway! I like the Second Skin, Superhero Body, Supermodel Legs Products, Lush Lips, and Sweet Clean. ($135 total) I have a big problem with staying moisturized here in Canada, so these would be a huge help! I have wanted thee Cold Plasma for the longest time! As I've gotten older my skin has gotten drier and harder to keep supple and moisturized. I would like to try the Intensive Moisture Therapy to treat my dryness. Thanks for the chance to win this fabulous product! I could use the Sun Kissed TINTED MOISTURIZER WITH SPF 25 as I am really trying to protect my skin from the effects of the sun and I find make up can be too heavy in the summer heat - this would be perfect! I am new GFC follower Danyell F and I would like to try the the First Blush from his new Super line because it firms evens out your skin tone. I love the MD Perricone line and have been wanting to try the Advanced Face Firming Activator because of it's ability to lift and firm. I would LOVE to try the Cold Plasma! I would choose the O-Mega Moisturizer Nourishing Cream. My skin gets very dry when exposed to the hot summer sun. This product offers UV protection and helps hydrate the skin. Just what I need! I follow with GFC. I would love to try the Cold Plasma since it helps fight all the signs of aging skin. I would really love to try Bright Eyed~I really need an eye cream & this sounds wonderful! I follow via GFC. I would love to try the Advanced Eye Area Therapy to help with my under eye wrinkles. I'd love to win the First Blush, Acne Solution, and Detox Elixir! I'm in my mid-twenties and am starting to notice my skin change a bit (while still suffering from those pesky breakouts! ), so I'd love to win some skincare products! I would love the skin nutrition kit because my skin could use a little tlc! Thanks for the giveaway! I follow with GFC and I would like the Bright Eyes because the skin around my eyes is starting to show its age. I would love to try Perricone Cold Plasma Body. I live at the beach and am exposed to the sun year round so need high quality moisturizer.